As modern styles and minimalist looks become more popular, many sleepers are electing to purchase platform beds. While the style is trendy and many desire the look, many unfortunately don’t take the necessary steps to find a proper mattress. Platform beds utilizer different support systems, meaning your mattress selection requires further scrutiny than normal. By assessing weight, function, and type of support you’re seeking, we can guide you to the mattress that will best suit your frame and lifestyle. Many older mattresses were intended for flipping; meaning you could lie on both sides and not experience a difference in comfort. Advances in mattress technology have changed this. Nowadays, most modern mattresses have been converted to one-sided, no-flip options that include all the necessary features within one unit, making purchasing much easier—especially in the case of platform beds. When you think of a normal mattress, you may conjure up images of an innerspring mattress (a mattress style we will go over in another section), which is always sold alongside a box spring. Mattresses designed for platform beds don’t need a box spring, the support is already included in the mattress. Be sure when you buy your mattress you don’t unnecessarily buy a box spring; it’s a waste of money and could actually hamper your sleep. As the mattresses designed for platform beds are one-sided, there is a designated top and bottom. This design allows them to be placed on a hard surface, like a platform bed without the added cost and height of a box spring addition. Many users like the lower bed height, as the lack of a box spring makes the overall bed thinner, despite its lifted surface. Platform beds are desired for various reasons; a clean modern look, the ability to create an open-looking bedroom, and the additional storage space all make this a great option for a variety of sleepers. One of the major benefits of platform beds is that they don’t need a box spring. On the contrary, using a box spring can actually make the platform bed unstable and unsafe. This is what makes picking a mattress so tricky—if looking for the best mattress for platform beds, it can be a completely different process than what you’ve done in the past. Memory foam mattresses can be considered one of the best mattresses for platform beds as they are designed with the intention that they will rest on flat, solid foundations. Memory foam mattresses are ideal for those looking to relieve pain from pressure points, as they help spread your body weight evenly across the bed. Memory foam is also temperature sensitive, meaning you’ll have a cool sleep on a mattress that immediately responds to your body movement. Sleeping partners will benefit from the diminished motion. Be sure to check on weight requirements and the listed weight capabilities of the platform frame. Memory foam can be heavy, and the last thing you want is to find a mattress that breaks your support system. Latex mattresses are also contenders for the best mattress for a platform bed. Latex options are created to work with sturdy foundations, and with their thick, firm support, you are less likely to feel the platform. Latex mattresses are popular options for those looking to alleviate pain and pressure on the joints. Similarly to foam mattresses, latex mattresses can be extremely heavy, so be sure you assess weight capabilities before purchasing. While memory foam and latex mattresses are the best mattresses for a platform bed, there are other options that can be used instead based on preference. Hard-side waterbeds are not applicable for platform beds, as they need surrounding support. However, softside beds are able to lay on solid flat support, meaning they are a viable choice for a platform bed. Waterbeds can be impractical and they do require a lot of maintenance. Many find that waterbeds do not provide the support they need, while others cite that they are better on pressure points than the run-of-the-mill innerspring mattresses, which we will discuss next. You’ve likely slept on an innerspring mattress for multiple years of your life, but it is these mattresses that get a bad rap for causing pain and aches. Innerspring mattresses feature interconnected coals, with a top layer of fiber, foam, or both. These mattresses require a box spring, making them a bad choice for platform beds. These are the most common mattress type, making them an inexpensive option; however, you get what you pay for, and may experience pain and an uncomfortable firmness level when using these mattresses with a platform bed. If you’re looking to spend a smaller amount, futon mattresses are viable options; however, their durability and comfort are definitely lacking. These mattresses are usually thin, but their light weight makes them a good option for a platform bed in a pinch. If you’re looking for guest bedroom options that don’t see many visitors, than this is an okay choice. However, if this mattress purchase is for a bed that will see every day use, a futon mattress is not the way to go. This 10-inch latex mattress is a dream for those of us who still want affordability, comfort, and support all wrapped up in one. We selected this as a contender for best mattress for a platform bed because of its light weight, which is perfect for frames that can’t handle heavy foam options. Its weight makes it easy to move, perfect for any future frame changes. 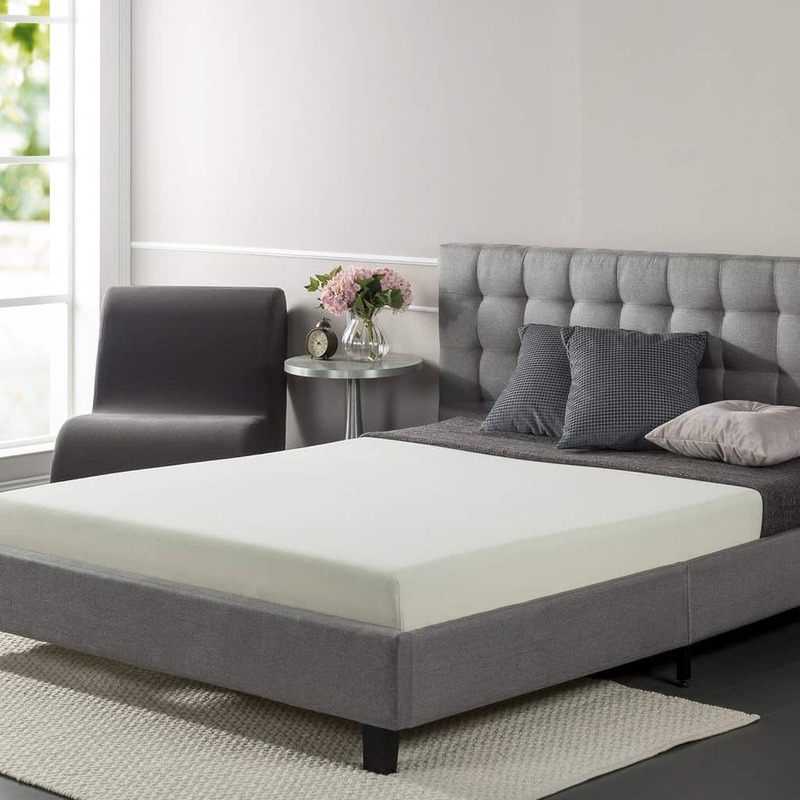 This mattress offers six inches of 1.5-pound density base foam to make sure your pressure points are relieved throughout the night, and its cradling foam makes sure you don’t toss and turn in the middle of your sleep. Our favorite feature is that the latex is breathable and hypoallergenic, making it a great option for sensitive sleepers. Easy to clean and lightweight, the cover really is the icing on top of the cake for this mattress. Perhaps our favorite feature on this mattress was the double air flow comfort foam. Who can sleep through the night with a sweaty, heat-inducing mattress? This mattress actually contains three inches of bi-directional foam that allows for air flow while still supporting the spine. The lightweight qualities make it a great option for platform beds with low weight capabilities. It also makes it easy to move around, which is good for any of those who may struggle with back problems. 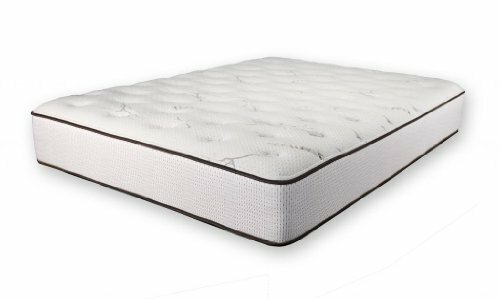 The gel foam is very comfortable, and it features a medium firmness that can cater to several different types of sleepers. It cradles the body but doesn’t give too much, so as to prevent any hyperextension of the back. This bed definitely felt like one fit for royalty. While it is light enough to rest on top of a platform bed frame, it still offers 11 inches of support for your spine, hips, and shoulders, making it a wonderful option for sleepers of all types. The HD gel memory foam provided just the right amount of cushion during our trials, as it conforms to the body without “hammocking,” meaning you’ll still receive the support your back needs. The 2-inch airflow layer must really work, because the mattress stayed cool throughout the night and didn’t disrupt any sleeping patterns. This breathability makes it a viable choice for any climate. This mattress comes with a four-pound density weight, meaning your back gets the support that it needs. The several inches of memory foam layered on top of base support make this a bed that’s both cushioned and the right level of firmness to do the job. This mattress works easily without a box spring, making it a great option for platform beds, but in case of a frame switch later on, you can still use it with a variety of frame options. This mattress is available in 6-, 8, and 12-inch options, meaning you can customize the height and level of plushness you desire with the click of a button – which was one of our favorite features. With 4.5 inches of high-density foam, your spine gets the essential support it needs with this mattress, but the 1.5 inches of soft mattress foam more than makes up for the comfort factor. This balance made it one of our top picks. We like that this mattress is made with natural plant oil instead of the traditional petroleum compounds­ – it means a fresher bed for a longer period of time and less cleaning or odors to worry about. We love that this mattress has a lighter weigh, meaning it will work with any kind of bed frame you’re using, whether it be a box spring or a platform bed.